Does your current space need a lighting makeover? Or are you building a new space and want to get the lighting design just right? Lighting Concepts has everything that you need. We’ve been following the trends of the lighting world closely for almost 30 years, staying on top of what’s up-and-coming so we can supply our customers with the beautiful lighting they need. It’s one of the things that has set up apart as a premier lighting supplier in the Trussville area! Discover what we’re seeing as the up-and-coming interior lighting trends of 2018! Are These Interior Lighting Trends Right for Your Home? The trend of bold, dark color palettes is going to continue into 2018. More homeowners are ditching pastels and opting for rich jewel tones on their walls as well as in their upholstered furniture. The overall effect is a cozy, dramatic feel, as long as you have the right lighting. Bright lighting is a must for these dark palettes, or else it can make the room feel gloomy and closed in. If you aren’t lucky enough to have loads of natural light, you’ll want to increase the artificial light. Metallics are going to be huge in 2018! We saw this trend really take off this year and it’s sure to continue into the next one. Lighting fixtures made with copper-colored metals are especially popular. We’re seeing a lot of silver fixtures making a comeback, too, possibly because of the way that they sparkle against the darker palettes. Lighting fixtures are going to be more geometric than ever in 2018. You’ll see lots of straight lines and sharp angles on lighting fixtures, especially in cage structures. This trend is often coupled with the metallics trend for big impact lighting. We saw this trend really get started with pendant lighting but it’s going to spread in a big way to table and floor lamps in the next year. Smart lighting is going to become ubiquitous in 2018. Fortunately, this is a trend that won’t require you to change out your current fixtures. Most smart lighting is actually controlled by the bulb, not the fixture itself, so getting started with smart lighting is as easy as screwing in a bulb. From there, you’ll be able to turn on and off your lights with an app on your smartphone or through a smart home device. Many allow you to adjust the color of the lighting and set a timer, as well. Along with metallics, we’re going to be seeing a lot more natural materials used to make lighting fixtures. This includes a lot of wood. Wood fixtures are great for adding a little warmth to a space and they age beautifully. We’ll see a lot of wooden chandeliers in 2018, too, along with some table lamps and three-legged floor lamps. Wooden fixtures look great when paired with metallic accents, too, blending these two trends perfectly. 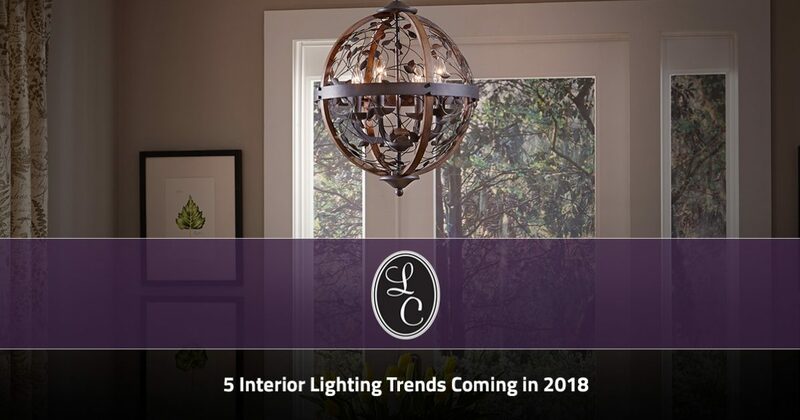 Are you ready to bring these lighting trends to your home in 2018? Lighting Concepts has you covered. We have all the interior lighting fixtures you need for your home, whether you want to be totally on-trend or stick to the classics. We offer a great range that you can check out on our website or in-person in our Trussville showroom. Our knowledgeable lighting design team can help you pick out the perfect fixtures for your home, whether you need a single lamp or a whole-house lighting makeover. Have questions about our products or services? Get in touch with us by giving us a call or contacting us through our website today.